The Philippines, the world’s second-largest archipelago with more than 7000 tropical islands, has it all – sights, tastes, feels, thrills and conveniences that make people fall headlong for this tourist-haven. Philippines, in fact, had a booming tourism industry in the 1970s; however, widespread corruption and political instability during the Marcos-regime throttled the tourism-sector. Of late, the tourism industry is experiencing resurgence. Philippines is a natural paradise where pristine white beaches, tropical rainforests, active volcanoes, mountains, hills (the Chocolate Hills of Bohol), rivers and waterfalls all join hands to create some enchantingly beautiful landscapes/seascapes. Philippines is the land of Rafflesia, orchids, the mouse-deer and thousands of endemic plant and animal species; the coral-fringed islands and the surrounding water-bodies of Philippines, likewise, are store-houses of varied marine life. Come to enjoy these natural treasures and you will get much as bonus – adventure sports, real cheap shopping, great night-time revelry and a taste of Philippines’ diverse cultures. Manila: Standing by the Manila Bay, Manila city (or Metro Manila) is a hot tourist destination with host of historical sites like Fort Santiago, the Intramuros, St. Augustine Church as well as other attractions like the Manila Oceanarium, the Malacanang Palace (the Presidential residence) and the Rizal Park. The city also has some important museums and cultural centers. Metro Manila is famous for its bargain-shopping and its exciting nightlife. Manila also promises thrilling excursions close at hand. Tourists can book their Manila hotel room at affordable prices and enjoy what this city has to offer. Usually hotels are available from 600-700 PHP (Philippine peso) yet a cosy hotel starts from 1,000 PHP / night (~$23). Cebu: Cebu City is the second most important city of Philippines and has something to offer to all. Being the oldest city, it has many historically significant sights like Magellan’s Marker and Fort San Pedro. Cebu’s exotic beaches, coral reefs and turquoise waters not only endear it to the Nature-lovers; they also present prospects of beach activities and water-sports. Cebu has some well-known wildlife sanctuaries, including ones for birds and butterflies. 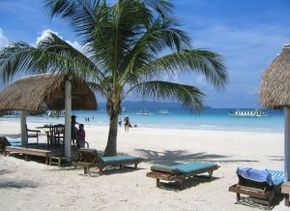 Cebu has some famous shopping malls, museums, art-galleries and resorts. Baguio: A modern and urbanized city, Baguio is the ‘Summer Capital of the Philippines because of its year-round cool climate. Still in touch with its natural side, Baguio is ideal if you are looking for orchids that bloom in abundance in the tropical pine forest. Baguio-attractions include natural sights like the Asin Hot Srings and the Maryknoll Sanctuary, religious attractions like Baguio Cathdral and Bell Church and a host of other attractions like the Philippine Military Academy, the Mansion House. Baguio has many parks, gardens and museums. The city’s handicrafts like hand-made fabrics, wooden curios, silver jewelry and filigree-work are in great demand. Philippines is among the fastest-developing economies of Asia, with the service sector as the chief contributor of the county’s GDP, followed by the industrial sector at the second place and agricultural sector at the third. Important Philippine-industries include – Automobile, BPO (in fact, Philippines is the second-largest call-center market in the Asia-Pacific region), electronics, food-processing, mining, textiles and garments. Philippines has a mixed-culture – you find elements of native cultures as well as foreign influences. One the one hand the culture tells a tale of the nation’s colorful history and on the other, the regional influence is pronounced too. The Spanish/Hispanic influence is the legacy of the Spanish rule over Philippines and the US-control over the region of nearly half-a-century left its mark; however, Filipino-culture has also borrowed elements of Eastern religions like that of Buddhism, Hinduism and Islam. All these elements blended with the cultures of the primitive Malayo-Polynesian tribes to give Philippines its rich cultural texture manifest in its varied arts and crafts, architectural gems and cuisines, dance and music forms, languages and religions, sports and recreations.